Photo credit: Dean Wm. Taylor, Ph.D. 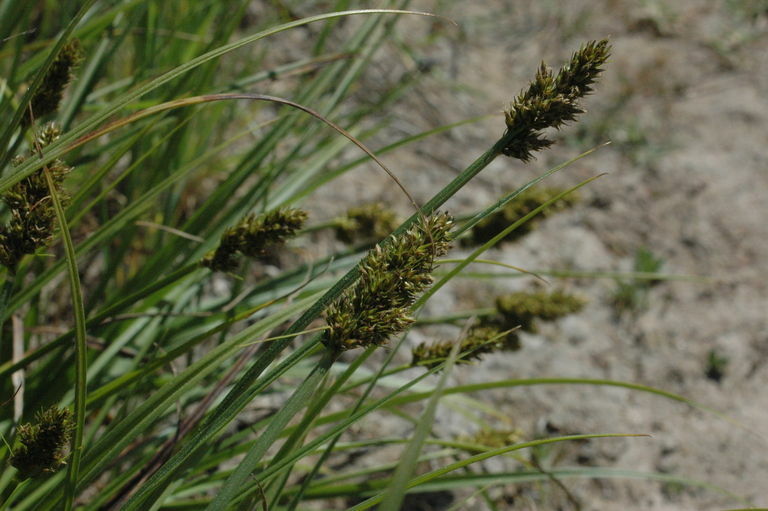 Dense Sedge has short, stout stems growing from thick, black rhizomes. There are several thin leaves, with tight sheaths, growing from each stem. 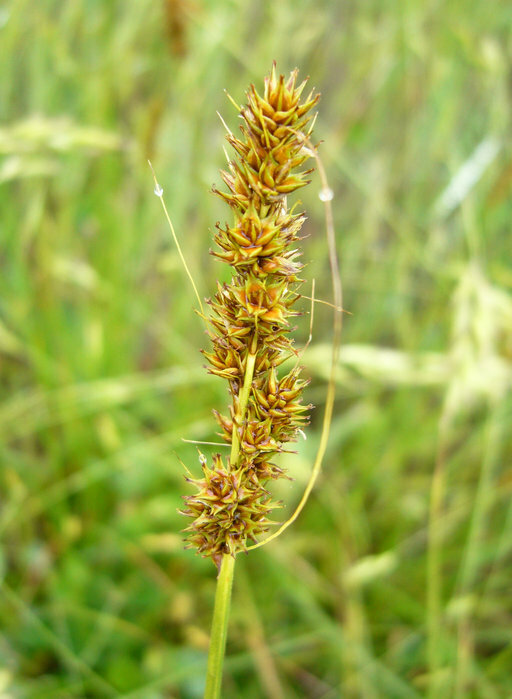 The flower spikes are tightly arranged and oval shaped, from 1 – 2.” The small flowers are pollinated by the wind. The tiny fruit is a three-sided achene. This species is excellent for erosion control and stabilizing stream and pond banks. The rhizomes form a thick mass, trapping sediment and slowing the flow of water. 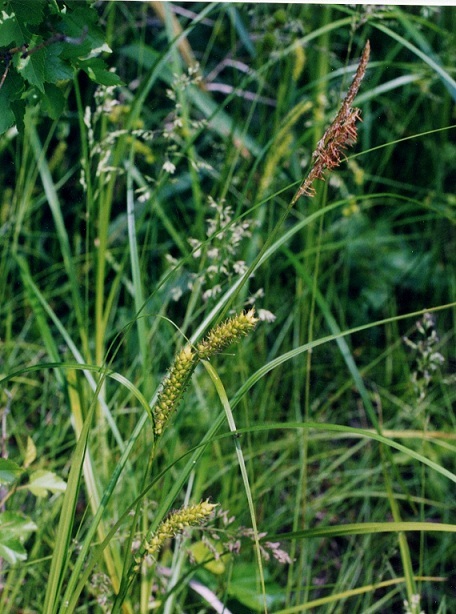 Ornamental Value: Admittedly, the flowers of all sedges are not showy: the petals lack both bright colours and intricate forms. However, they are extremely unique in their form and their blooming cycle is remarkably long – from April to September. Moreover, the plant itself provides colour all year, never turning brown, even in the driest spells. Add them to a late summer bouquet with other natives – Cattails (Typha latifolia), Goldenrod (Solidago canadensis – and no, it doesn’t cause hay fever), Asters (Symphyotrichum), and don’t forget the florists’ favourite, Salal (Gaultheria shallon). A vase filled with these ordinary plants will highlight their unique shapes. Remember to cut wild flowers that are very well established (or growing in your vegetable garden, where some dare to call them weeds!). Native Plant Gardening/Wildlife Habitat: All sedges are extremely important to a variety of wildlife species. 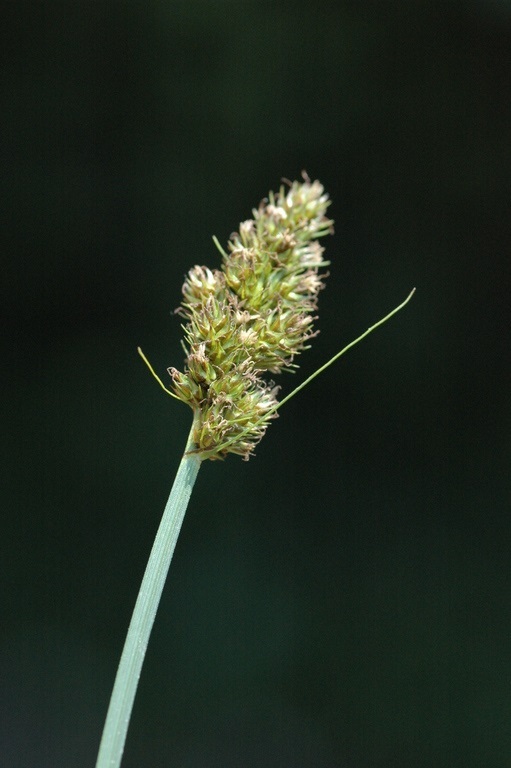 Birds of all type (waterfowl, shorebirds, songbirds and game birds) eat the seeds of Dense Sedge in moderate amounts. Muskrats eat the roots of Dense Sedge and small animals, such as turtles, muskrats and snakes, seek shelter in its foliage. 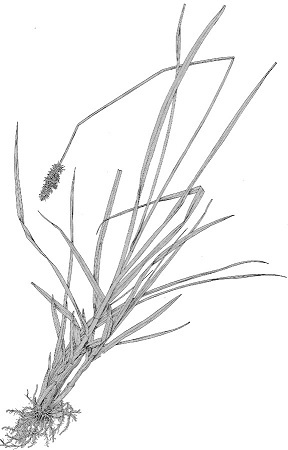 Waterfowl nest in areas where sedges form a dense cluster. Amphibians lay their eggs at the base of these plants and the young are somewhat protected from predation. 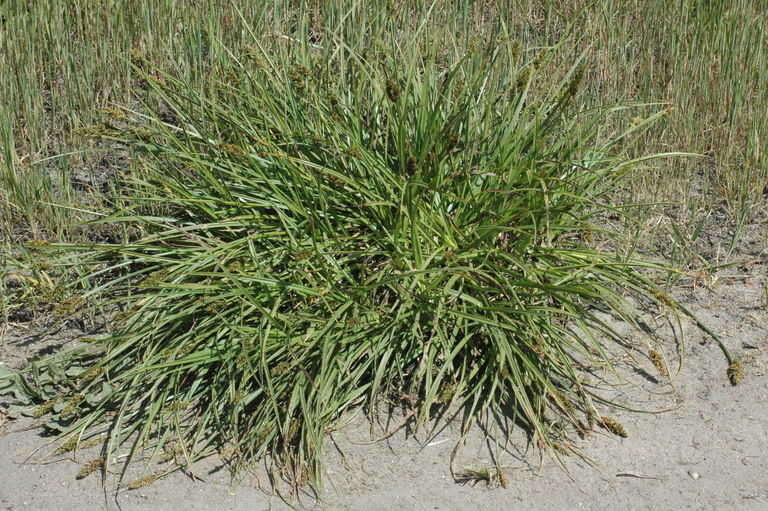 Historical/Cultural uses: Native people did not commonly use Dense Sedge. Propagation Techniques: The most successful means of propagating this plant are through bare rootstock. The best time to plant out on the Pacific coast is in mid- to late October, before the heavy rains have begun in full but the weather is sufficiently cool that the new plants will not lose a lot of moisture through evapotranspiration. These plants should be planted such that the crowns are even with the soil. Photo, left, credit: Dean Wm. Taylor, Ph.D.; Photo, center, credit: Jennifer Anderson, NRCS PLANTS Database; Photo, right, credit: Dean Wm. Taylor, Ph.D.
Mason, Herbert L. A Flora of California. California: University of California Press, 1957. 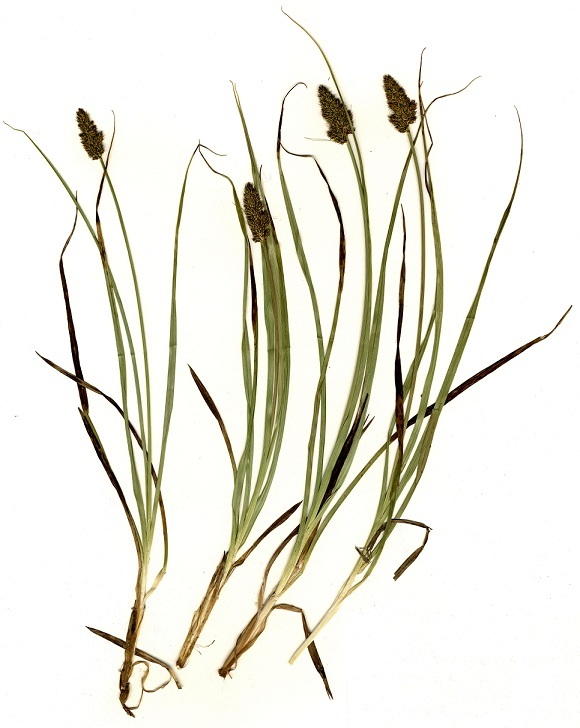 United States Department of Agriculture, Agricultural Research Service) September 2002) http://www.ars.usda.gov/is/AR/archive/jul00/grass0700.htm.